is flavoured distilled liquor, emerald green in colour, turning to cloudy, opalescent white when mixed with water. Absinthe inspired many prominent artists, writers and poets. Just to name a few - Vincent Van Gogh, Oscar Wilde, Manet, Ernest Hemingway - in fact his masterpiece " For Whom The Bell Tolls " was written under the influence of "The Green Fairy". Absinthe was first produced commercially in 1797 by Henry-Louis Pernod, who purchased the formula from a French exile living in Switzerland. Artemisia Absinthium is the chief flavouring ingredient, native to Europe and Asia. ; other aromatic ingredients include aniseed, licorice, hyssop, fennel, angelica root, star aniseed... Wormwood is a long-lived plant, with greyish-green leaves and the flowers have a greenish-yellow tint, and like leaves give off a strong aromatic odor and are bitter to the taste. Our absinthe contains the same amount of thujone found in the 19th century absinthe. 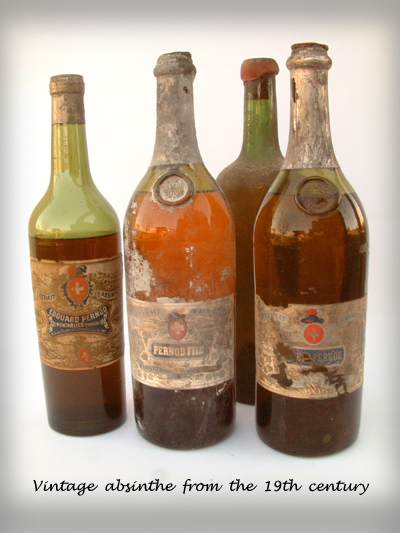 Unique pre-ban Absinthe bottles from different manufactures for sale. All the absinthe bottles are some 100 years old perfectly sealed. Absinthe that almost all the poets and artists from the 19th century enjoyed. 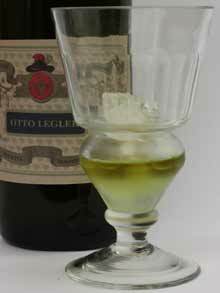 Otto Legler is a pre-banned absinthe reproduction based on a historically well known Legler-Pernod brand. Absinthe of superior quality. Very strong and probably the only genuine absinthe on the market. Distilled from carefully selected herbs and made from eau-de-vie, distilled from selected wine. An old alembic (absinthe) still heated by steam is used as well as the same amount of wormwood as in the 19th century legitimate Absinthe. NO artificial oils, colorants or sugar are added. Swiss La Bleue - absinthe made by using traditional 19th century distilling methods - macerating Grand wormwood (Artemisia absinthium), genepl, green anise,fennel and other plants in an eau-de-vie.The macerated charge is distilled in an original absinth still. It is not colored and turns milky when water is added. Traditionally distilled modern absinthe from finest herbs including grande absinthe and petite absinthe.Colored naturaly and has no added sugar or any other artificial colorants or color stabilizers.Rich in herbal content, smooth and not bitter.Louches nicely when water is added. Cannabis vodka is a modern drink. It is a result of the maceration of true cannabis seeds. The cannabis seeds give the cannabis vodka the unique taste and aroma. The superb craftsmanship of the Absinthe Fountain. Manufactured from the same type of nickel alloy as the originals, with a durable and attractive satin finish with the classic "acorn" top. The fine hand made Absinthe Glass. Both historically authentic,and a practical way to store your absinthe spoons. Absinthe music dedicated to the genuine absinthe. 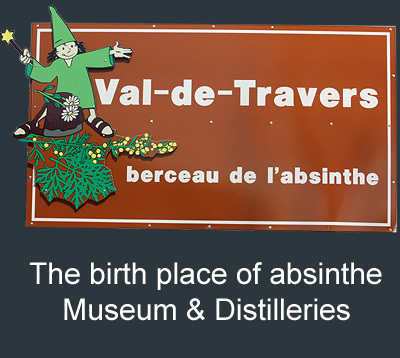 Absinthe Museum in Mortiers, Val de Travers in Switzerland. The world’s largest and unique collection of absinthe and collectibles. The absinthe festival day in Boveresse, Val de Travers in Switzerland. Spend your vacation in Switzerland – the holy grail of absinthe.